Girlie Girl is back! Girlie Girl is back! She came back! Oh, this was a wonderful mini Dachshund weekend. My friend Girlie Girl has returned! Oh, I just realized that you probably don’t know who Girlie Girl is and why this mini Dachshund is so happy that she’s returned. Here is a picture of my friend, Girlie Girl before she left for the hospital. You see, she was my petite white little teddy bear, my furry friend. 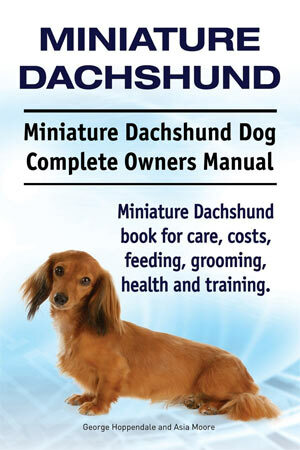 After all, every mini Dachshund needs a friend and companion, be it another Dachshund or a furry friend. Girlie Girl and I were as close as a mini Dachshund and their friend could be. After a while, I chewed her nose off. Then one by one, I chewed her eyes off. After a time, she got kind of dirty so Mommy gave Girlie Girl a bath. Good as new, except for the fact that she had no eyes or nose. I started to pull out her stuffing and get it everywhere. 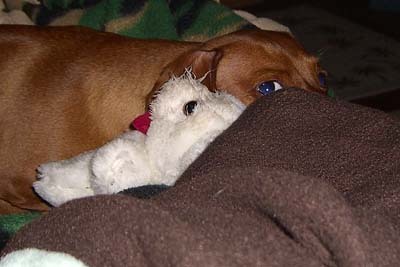 Remember, we Dachshunds love to burrow! Then one day, it happened. I woke up and my friend, Girlie Girl was gone! She was no where to be found, just vanished without a trace. I strongly suspected that Mommy and Pop Pops had something to do with her disappearance. Of course, they never confessed. I will tell you that this mini Dachshund was pretty mad at them for a while. Until I talked to my dachshund friend Izzy. You may remember her, she said ‘yes’ and became my Dachshund Valentine! Well, I told Izzy the story of my friend, Girlie Girl and she said that maybe Girlie Girl went to the hospital for reconstructive surgery. Absolutely brilliant! Why didn’t I think of that? She is so smart that Izzy of mine! After speaking with Izzy, I felt better and I was not so mad at my people. As the time went by, my wounds began to heal. Then, to my surprise, yesterday, I came in from the back yard and there she was, Girlie Girl, waiting for me on the couch! 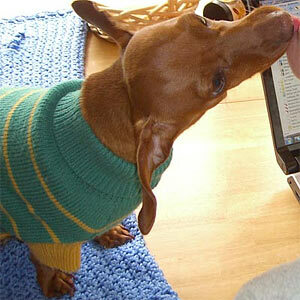 My dachshund emotions overtook me and all I could do was rush to her side and smother her with kisses. We spent the day snuggling and napping. In the evening, we laid by the fire together, just me and my furry friend. Girlie Girl looked so different, but beautiful. The surgeons must have done a wonderful job. Her fur was nice and tanned instead of white. I asked Mommy why Girlie Girl was so much bigger than before she went to the hospital. Mommy said that she did her growing when she was in the hospital, just like Dachshund puppies grow. I am just so glad Girlie Girl is back! I promise not to chew off her nose and eyes! I am so glad you have your best friend back. Maybe Girlie Girl was able to take in some sun and that is why she is now tan. Just a thought…..